On an empty background, a woman leans in a restrained manner towards the right-hand picture margin. This movement displaces the darkest areas of the picture, namely the heavy coiffure (tamamusubi hairstyle), well away from the centre of the picture. The figure is thus thrown off the balance, but is really stabilized by the dark border of the robe in the lower part of the picture, with its decoration of stylized waves. In the lighter space between these two poles – the dynamic contours of the hairstyle and the quite area of the black border – all the colourful elements are displayed, which lend to the figure, and thus the picture, its actual identifiable meaning. On the sleeves and shoulders flow clouds with stylized flashes of lightening. The robe is fastened together with a wide belt decorated with cherry blossoms and a narrower belt in shibori technique (negative imprints created by binding the cloth with thread). The voluminous bow of the obi with its soft blue colour offers a counterpoint to the decisive contours of the drawings on the robe in the lower left third of the picture. The central axis of the image incorporates the angry dragon with its gaping jaws. 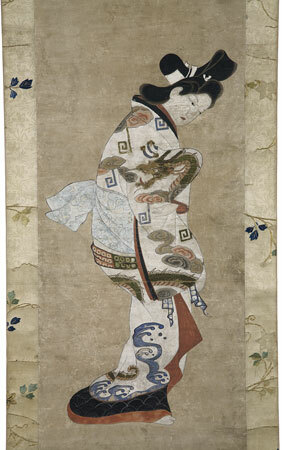 With her hidden right hand, the woman lifts up the sleeves of her kimono, supported by the visible left hand. This gesture has been retained in Japanese dances to this day. The black and red bands of the border and the black scaly pattern of the dragon’s body, which is never shown in its entirety – as if he were really wrapped around the figure – provide accents which are taken up by the black area of the hair. The facial features and the generous patterns of the robe are reminiscent of the pensive female figures of SUGIMURA Jihei. The painting should be attributed to his circle. The dragon is one of the mightiest of the fabulous creatures of the Chinese cultural region. In China he represents the Emperor himself. However he is above all an aquatic animal, and he is therefore often shown as a ruler of lakes, rivers, or the sea. He is regarded as the most powerful creature of all. In his image, Chinese and Indo-Buddhist conceptions are clearly interwoven. In India, the snake goddesses (Nâga), which correspond to the dragons of China, are accorded the same functions. In Japan, such Chinese and Indo-Buddhist conceptions intermingle in ceremonies such as Gyōdō as early as the ninth century A.D. Even then, their main functions were to make rain or to stop the rainfall. For example, the dragon dance Ryō (Ryū)-ō of Bugako is still performed fort his purpose today. The dragon winding around the woman’s robe may, however, also point to another contextual background. Among the many forms of the Bodhisattva of Mercy, Kannon (skr. Avalokiteśvara), appears the figure of Ryū-zu Kannon („Dragon’s head“ Kannon) in the form of a female figure embraced by a huge dragon. This theme enjoys great popularity in applied arts; e.g. in inrō, netsuke and also in sword decorations.